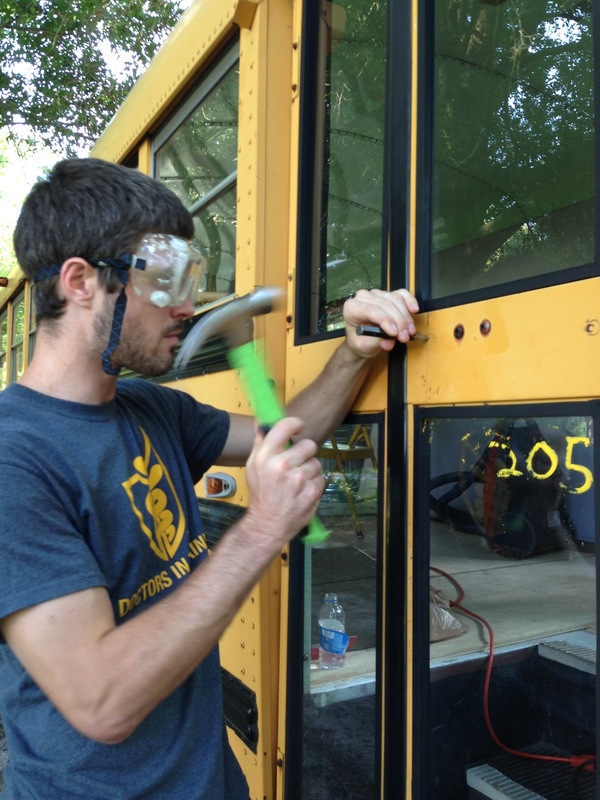 This week we took the time to install a lock on the front door of the bus. 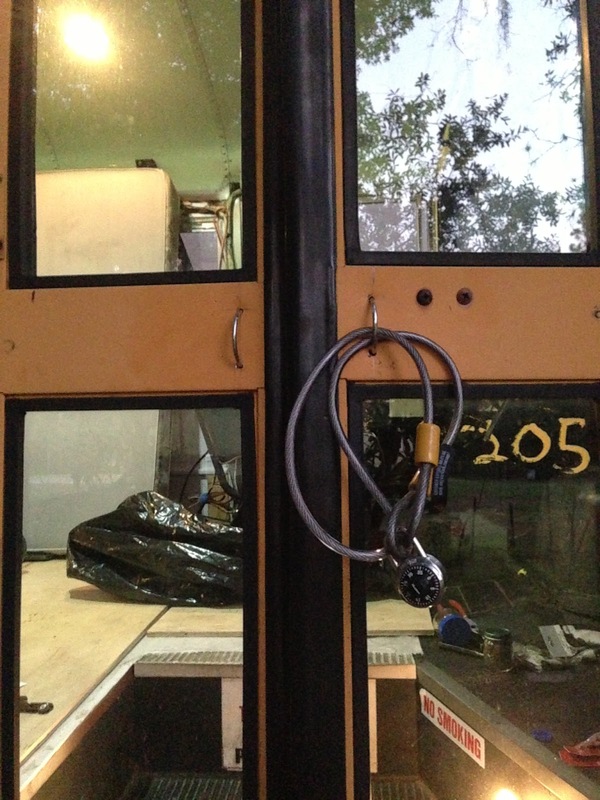 We would like to eventually replace the front door with a traditional door or an RV door, so for now this is a temporary solution. As per usual, we came up with some fairly complicated, expensive ideas on how to accomplish this and then after seeing the price tag and amount of time necessary for such an endeavor, paused and reevaluated the situation. A barn door latch was our first simple idea, however the spacing between the two doors created an issue as most barn door latches that we could find only allowed a 1-2 inch gap and the metal on our doors is three inches apart. 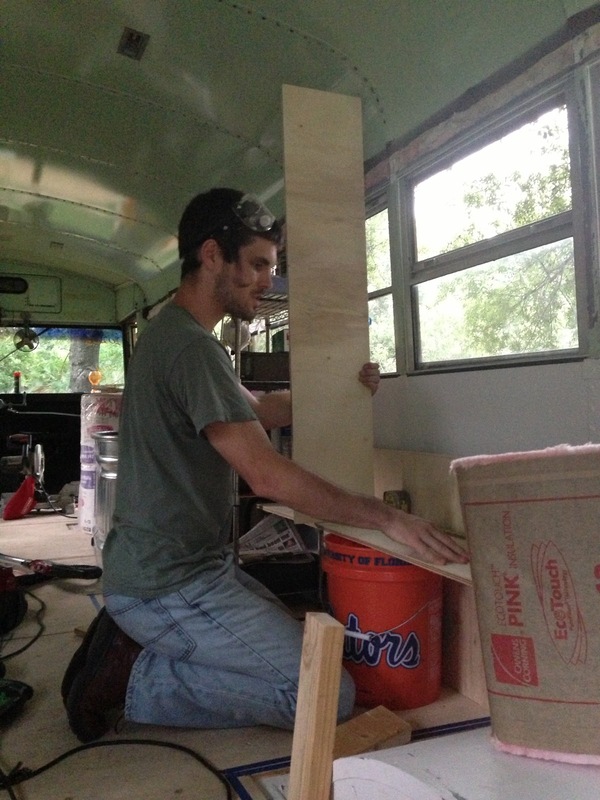 After much deliberation, Chris came up with an excellent, simple, affordable solution. My favorite kind! 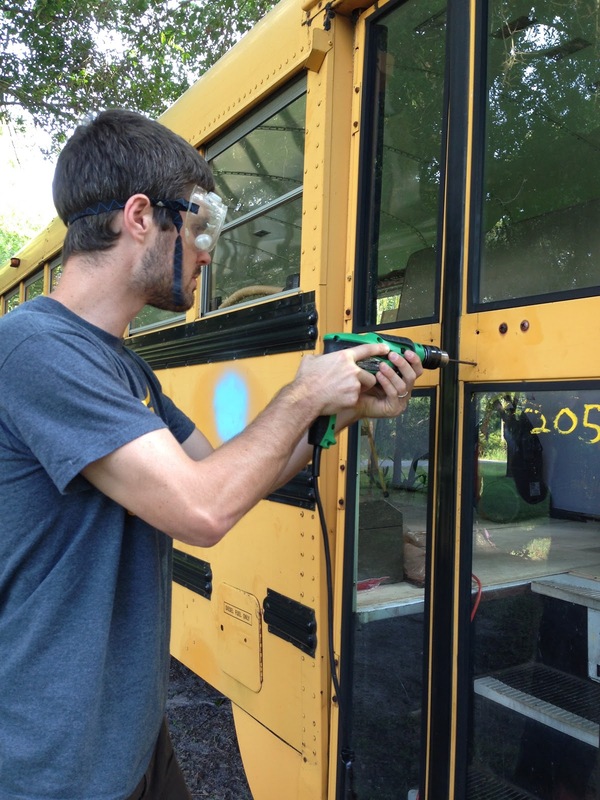 First we bought 2 u-bolts like the one below and then drilled 4 holes in the bus door for them to slide into. We used this chisel to widen the hole because our bit was a bit too small. 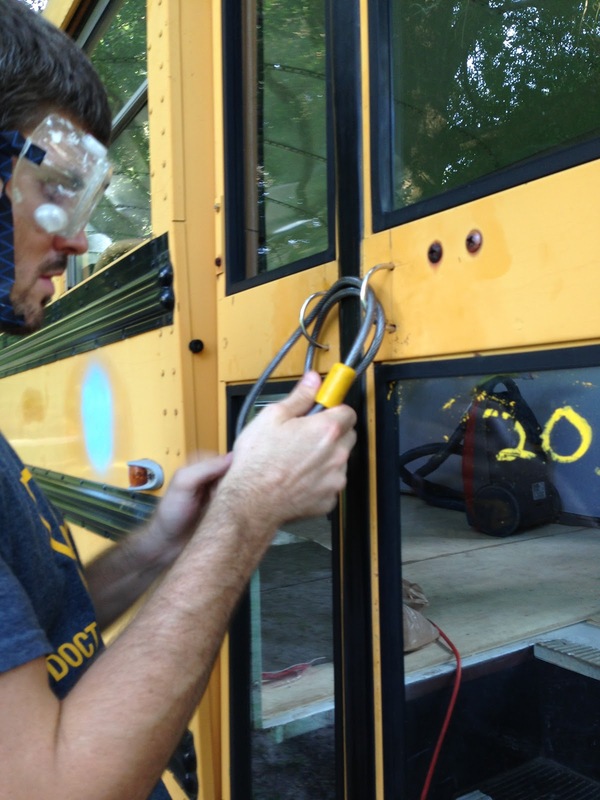 Then we put the nuts on the bolts on the inside of the bus so that the u bolts can't be removed from the outside. 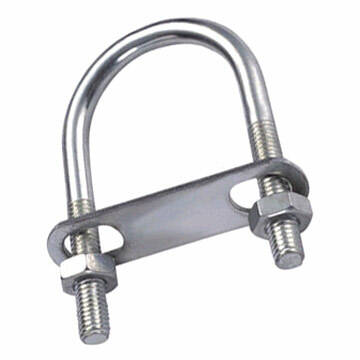 We used a bike chain and lock that we had sitting around to loop through the u bolts and tahdah! A $6 solution! Chris was nice enough to stand there holding that large saw while I took this picture. We keep it locked up to one side when we're working so no one can lock us inside. 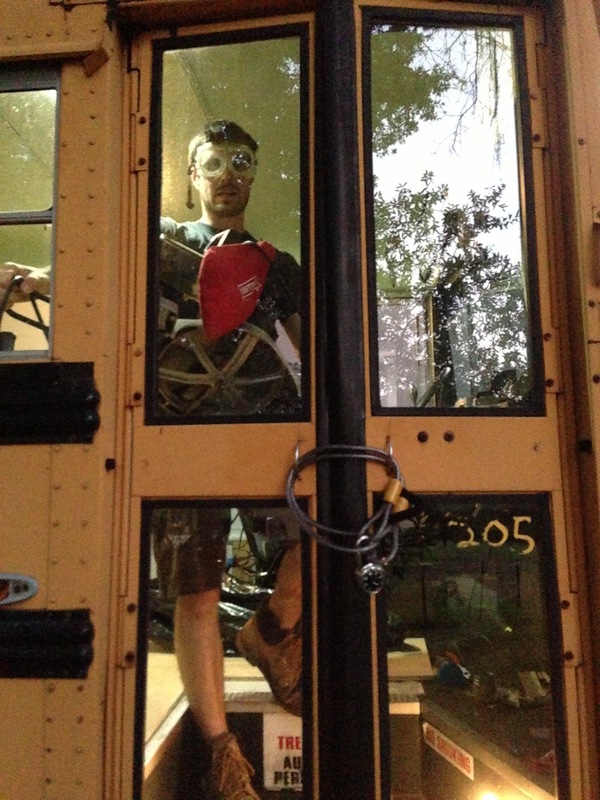 The back of the bus had an even simpler solution. 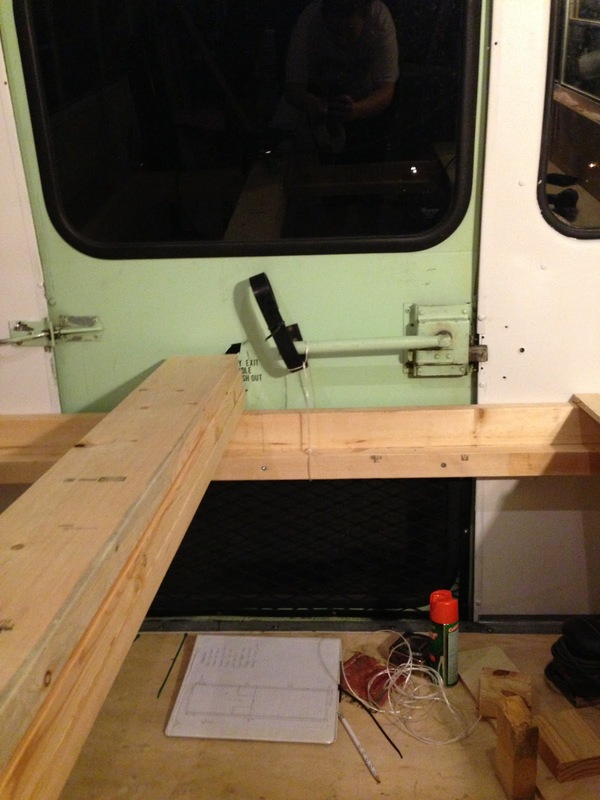 Since the door uses a lever to open, we just tied the lever to the bed frame. The outside lever is much shorter than the inside so it would take an huge amount of strength to break this tie due to the fulcrum of the larger inside lever. We also *finally* finished the last of the screws in the ceiling. 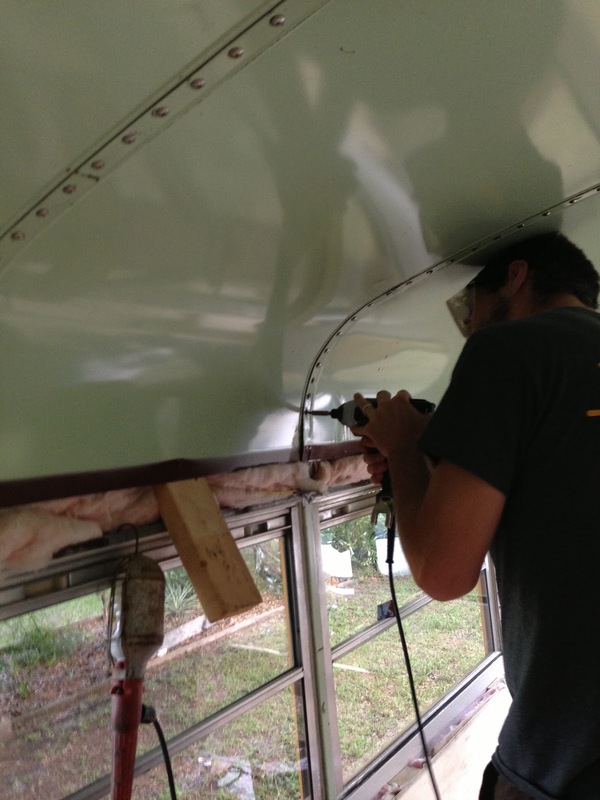 There were a few that we were unable to get back in their original place so we ended up drilling new holes in the cross beams and then inserting the screws. 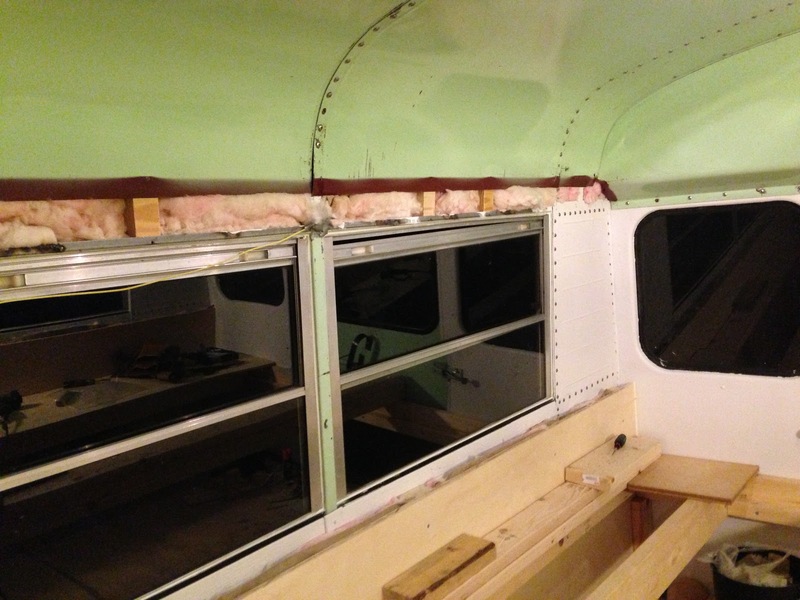 so we can reinstall the side panels to cover the gap above the windows. We've also been working on a lot of mockups to get a better sense of how we're going to be building up the walls for the different areas. They typically look like the picture below but since we are in no way professional builders, it really helps to see in person where studs, walls and joints are going to be. 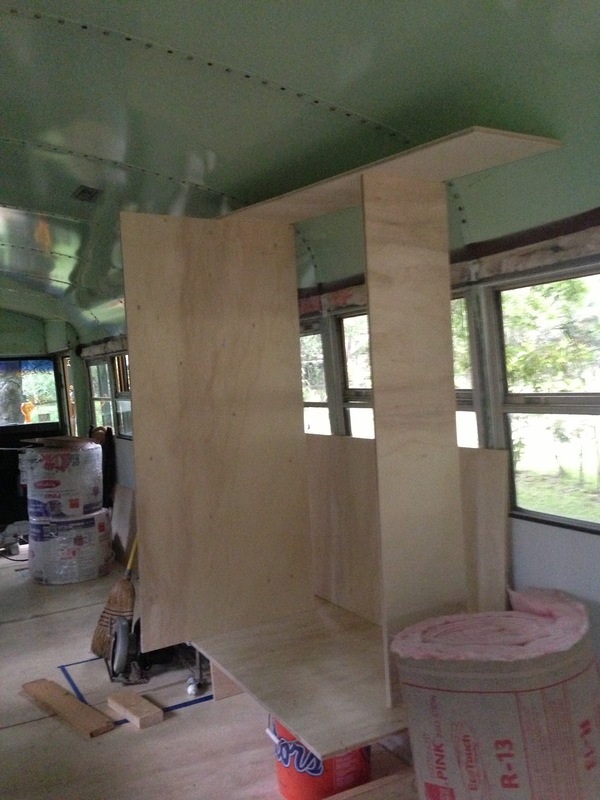 The closet walls are coming along nicely and we've made some minor adjustments to our floor plan. 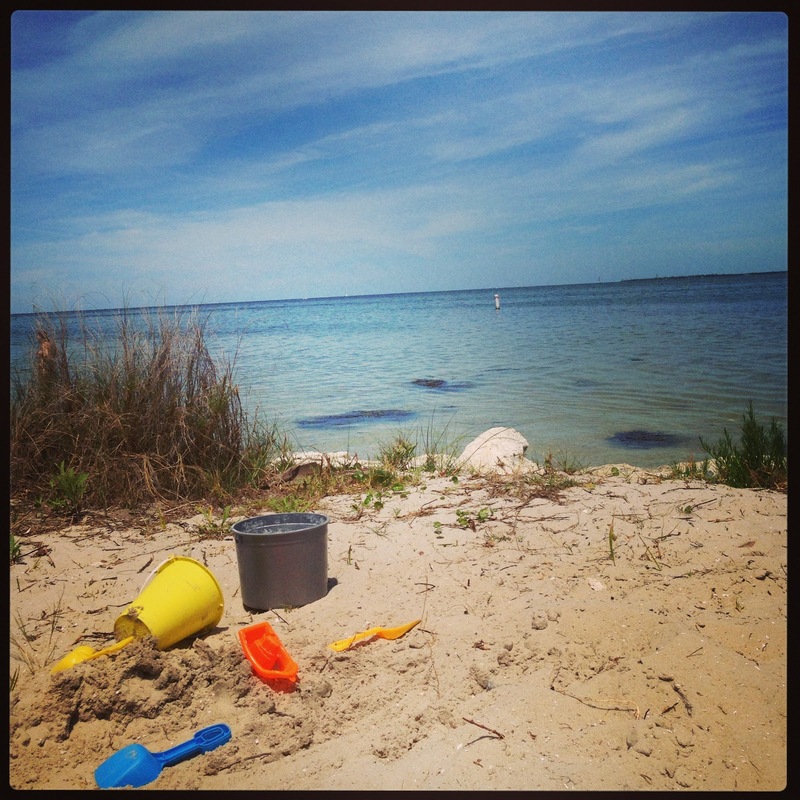 We took today to enjoy some time at the beach with friends and we hope to have a very successful bus day tomorrow! Can’t wait to see the end result. Let us know if we can offer any info or resources. 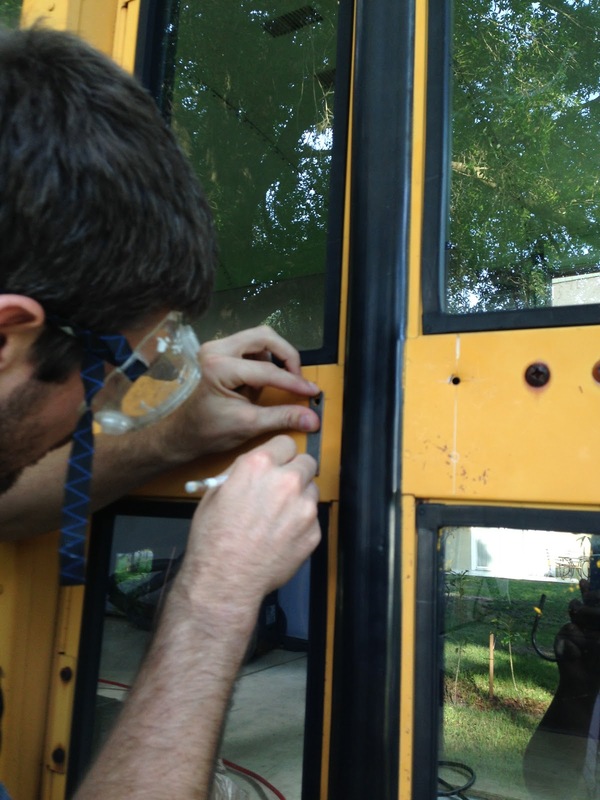 It is very important to make a door lock for a bus unless people will start removing some of the parts inside the bus and sell it. Thanks for sharing these useful information. Did you know that more and more vehicles are being victimized by invasion and robbery every day? In Vancouver, break-ins and invasion are exponentially rising. Are you doing what you can to protect your home?